Can I Sue for Lost Wages and Emotional Distress after a Car Accident? The short answer is yes, you can recover for wage Loss and Emotional Damages after Car Accidents. The law in Ohio strives to make an injured party “whole” after they have been involved in a car accident. However, the word “whole” takes on a different meaning depending on the situation. The categories of damages under Ohio Law are compensatory, non-economic and punitive. Let’s take a look at how these damages work in the context of an injury accident. Any other expenditures incurred as a result of an injury or loss to person or property that is a subject of a tort action, other than attorney’s fees incurred in connection with that action. As such, Ohio law – under ORC section 2315.18(2)a – permits a victim of a car accident to recover all wages, salaries or other compensation lost as a result of the car accident. However, it is critical to obtain the appropriate proof of this loss – which usually involves your Attorney working directly with you employer to provide verification of the loss. It’s worth noting that the law in Ohio does not contain any limitation on the amount of compensation one may receive for this type of loss after a car accident injury. As outlined below, Non-Economic damages in Ohio are not treated the same. Non-pecuniary harm that results from an injury or loss to person or property that is a subject of a tort action, including, but not limited to, pain and suffering, loss of society, consortium, companionship, care, assistance, attention, protection, advice, guidance, counsel, instruction, training, or education, disfigurement, mental anguish, and any other intangible loss. However, please be aware that non-economic damages are subject to a variety of limitations and caps in Ohio. Speaking with a personal injury lawyer is vital to determine how these limitations may impact your claim. The actions or omissions of that defendant demonstrate malice or aggravated or egregious fraud, or that defendant as principal or master knowingly authorized, participated in, or ratified actions or omissions of an agent or servant that so demonstrate. While exceedingly rare, there are circumstances that warrant such an award. In order to determine if your specific situation might lead to such an award, it is best to speak with a qualified and experienced personal injury lawyer. Sawan & Sawan is an Ohio car accident law firm with Ohio car accident attorneys licensed to practice law in the State of Ohio. If you were injured in Ohio and would like to speak further about wage Loss and emotional damages after Car Accidents, call Sawan & Sawan today at 419-900-0955 to schedule a free consultation. The car accident attorneys at Sawan & Sawan serve the following cities in Franklin County, Ohio: Bexley, Ohio; Canal Winchester, Ohio; Columbus, Ohio; Dublin, Ohio; Gahanna, Ohio; Grandview Heights, Ohio; Grove City, Ohio; Groveport, Ohio; Hilliard, Ohio; New Albany, Ohio; Pickerington, Ohio; Reynoldsburg, Ohio; Upper Arlington, Ohio; Westerville, Ohio; Whitehall, Ohio; Worthington, Ohio. 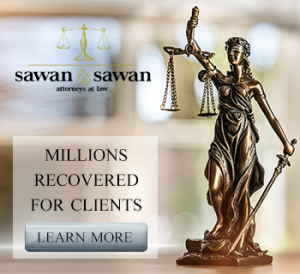 The car accident lawyers at Sawan & Sawan serve the following cities in Lucas County, Ohio: Maumee, Ohio; Oregon, Ohio; Sylvania, Ohio; Toledo, Ohio; Waterville, Ohio. Wage loss and emotional distress after a car accident can be difficult to calculate. Here's a breakdown. Call 1-866-INJURY-0 for a free consultation.